We are counted amongst the outstanding Swing Arm Exporters from India. The unmatched quality and unsurpassable performance has played a vital role in the enhancement of the demands of Motorcycle Swing Arm. The Front Swing Arm is highly durable and exhibits excellent performance in respective applications. Additionally, the array of the Bike Swing Arm includes Domed Cap Nut, Washer Spring, Washer Plain, Rear Shock Absorber, Rubber Inner Bush Kit, Plain Washer, Shaft Swing Arm, Bushing Rubber, Nut Hex./ flange, Arm Comp. 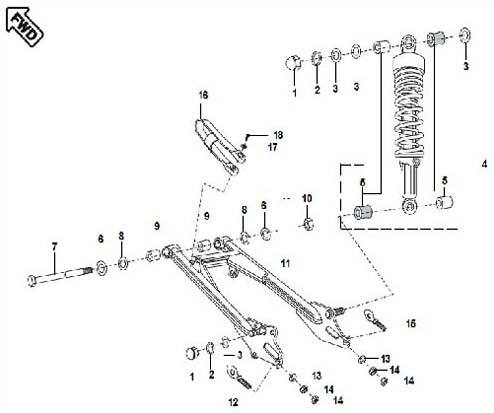 Swing / Bush, Adjuster Chain (RH), Washer Plain, Hex Nut, Adjuster Chain (LH), Damper for Swing Arm and Self Tapping Screw. Fig. No. Part No. Description Qty / Veh.